Join us for TGI Friday Special where you can meet some of your favourite on air personality, plus on the night we have cd & merchandise giveaways. Dance the night away with Old School Classics to Modern Day Anthems, Hip Hop, Afro Beats, Dancehall, Funky House, RnB, Swingbeat, Party Anthems and much more. We have music spread across two floors to ensure your musical delights will be taken care of. Check out the hourly drink promotions on the night and great deals on offer. 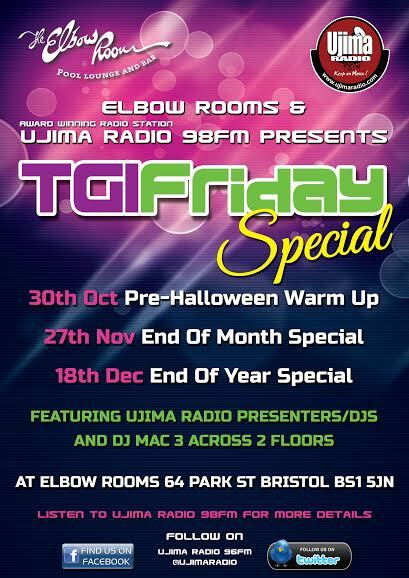 Doors open 9;00pm – 4:00am, Adm: Free entry before 10:30pm / £2 before 12 midnight / £4 thereafter.